Tripp Lite makes your PC installation one step easier. 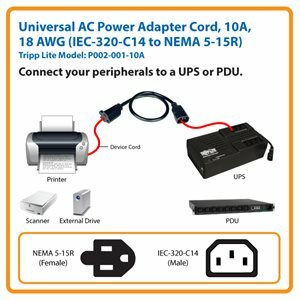 This 0.31 m (1-ft.) AC Power Adapter Cord allows you to plug a power cord with a NEMA 5-15P plug into the IEC-320-C13 outlet of a PDU or UPS. Installation with convenience is the name of the game. Features a NEMA 5-15R receptacle with an IEC-320-C14 plug. UL listed. With Tripp Lite’s AC Power Adapter Cord, you can use a PDU or UPS to power devices that have a 5-15P plug. Featuring a 5-15R connector on one end and a C14 connector on the other, this cable provides a reliable power connection from a PDU or UPS to your peripherals. Connect the 5-15R connector to the 5-15P plug on your device cable and plug the C14 connector into a PDU or UPS. The P002-001-10A is manufactured using superior materials for reliable performance. The high-quality connectors are molded for durability and have integral strain-relief for a secure connection. This SJT power cord has three 18 AWG conductors and a 10-amp rating. For peace of mind, the P002-001-10A comes backed by a lifetime warranty. It’s manufactured in compliance with strict RoHS specifications, reflecting Tripp Lite’s commitment to environmental responsibility.